Simply put, 2-Factor Authentication is an easy way to keep hackers from accessing your online accounts. It’s called a number of things: 2-Factor Authentication, 2-Step Verification, Multi-Factor Authentication, 2-Step Login, Login Approvals, Login Verification, etc. But no matter what it’s called, you should absolutely do it whenever possible! Hopefully by now you know how important a good password is. But you should also know just how hard it is for sites to protect your personal information, including your login ID and password. Just in 2013 alone some of the web’s biggest names have been hacked including Facebook, Twitter, Target, Evernote, and Adobe. 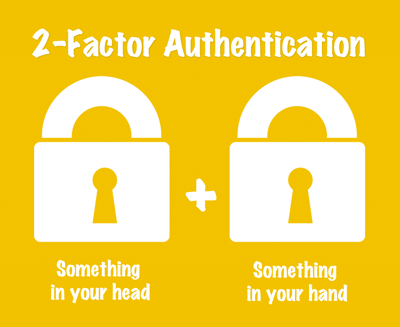 Why is 2-Factor Authentication so important? Because it’s pretty tough for a slimy teenage hacker in Romania to get ahold of your cell phone. That’s right, with 2-Factor Authentication a hacker has to physically have your cell phone to get into your account. It adds a critical layer of security to your account by combining something in your head (your password) with something in your hand (your phone). When you enable it, the site no longer lets new devices on it without first double-checking that the user attempting to login is actually you. After correctly entering your password, in most instances the site requires you to enter a code sent via text message to your phone. This way, even if a hacker gets ahold of your ID and password, they would still need to somehow get your physical cell phone to break into your account. So how do you set up 2-Factor Verification? Honestly, it’s a bit of a pain. Every site has a different way of doing it, and then you have to mess with your cell phone every time you login somewhere new. But, it’s still worth it. Just one time getting hacked and you will wish you had, especially if that hack is tied to your credit card somehow. Fortunately, there’s this great site run by some guy (Evan Hahn) that lists pretty much every major site that has a 2-Factor Authorization option. Go there now and at least bookmark it. Seriously. Because passwords are pretty useless when they’re lonely.